The U.K. has been granted a bit more time in figuring out the terms of its departure from the European trading bloc. 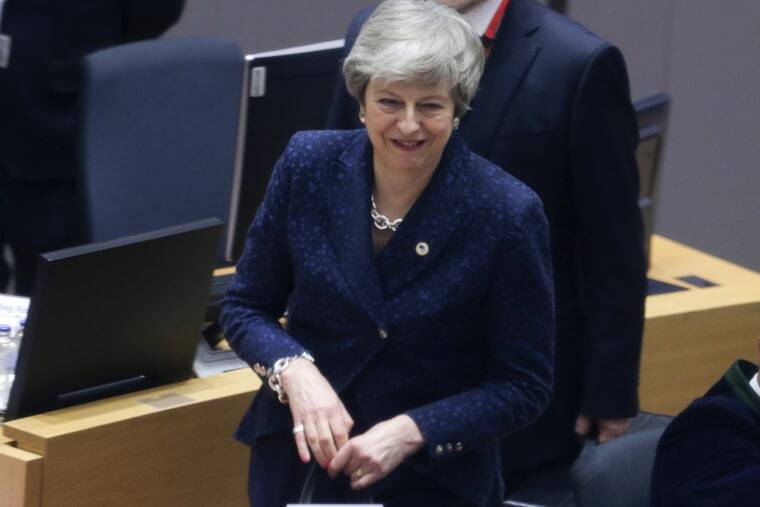 British Prime Minister Theresa May on Thursday won approval of her request for an extension to the deadline for the U.K. to exit the European Union, delaying the departure until either early April or late May. Donald Tusk, president of the European Council, announced his consent to the extension on Twitter after a summit in Brussels. Tusk said he would push the deadline to May 22, but only if the U.K. Parliament approves a withdrawal agreement next week. If British lawmakers fail to approve the Brexit deal — which they have already defeated twice — the deadline for departure will be on April 12. After the second defeat of the withdrawal agreement she negotiated with the E.U., May asked European leaders for a short delay to the March 29 exit date. The decision to grant the delay came a day after May delivered a televised speech to the public blaming Parliament for the Brexit impasse. It was met with anger from across the political spectrum. Opposition Labour Party lawmaker Lisa Nandy, who indicated Wednesday that she might vote in favor of the prime minister’s deal when it next came before Parliament, on Thursday described May's comments as "disgraceful." “Pitting Parliament against the people in the current environment is dangerous and reckless," Nandy said in a tweet. "It will have cost her support." Dissatisfaction from within the Palace of Westminster — as the Houses of Parliament are known — echoes the feelings of many across the country. Nine in 10 Britons believe the United Kingdom's handling of negotiations to leave the E.U. is a "national humiliation," according to a poll conducted by Sky News and released Wednesday. One in three believe the primary responsibility lies with the U.K. government. Because of the deep divisions that separate lawmakers, the prime minister's settlement with the European Union has been crushed twice in the House of Commons — suffering the heaviest and fourth heaviest losses in parliamentary history. Different factions believe that their preferred way out of the chaos — from a second referendum on Brexit to a general election, to a so-called soft Brexit or even no Brexit at all — has a chance of coming to pass. Lawmakers voted last week to reject the notion of leaving without a deal on March 29 but part of Tusk's conditions include they continue no-deal preparations. If the country is forced to leave the E.U without a Brexit deal, most experts predict that it would be an unprecedented act of economic self-harm for the country. May said in a statement shortly after Tusk announced his conditions that she would be returning to the United Kingdom on Friday to continue working toward passage of a withdrawal agreement. "What the decision today underlines is the importance of the House of Commons passing a Brexit deal next week so that we can bring an end to the uncertainty and leave in a smooth and orderly manner," May said. The prime minister also acknowledged the tensions among lawmakers and said she respected the passionate view of members of Parliament that have incurred debate. "I know MPs on all sides of the debate have passionate views, and I respect those different positions," she said. But May also refused to change course, calling on lawmakers to back her agreement and refusing to rule out crashing out of Europe without a deal if they did not back her.